One of the best ways for the church today to understand its mission is to take a closer look at the life of Jesus. Jesus was on a mission when he came and he was all about fulfilling his mission for the glory of God the Father. When we are not sure what our mission as followers of Jesus is in this world, we need to take a closer look at Jesus. Because the church is the incarnation of Jesus in the world. The church is called the body of Christ; we are to let Jesus live through us, serve through us, love through us. It is interesting that Jesus left the church to accomplish His mission, the mission of reaching people with the gospel. It is through the church that people will know God (Eph.3:10). God has always been on missions and he has always used people to accomplish his purposes. It was to his disciples that Jesus said, “as the Father sent me, so I am sending you.” Go and make disciples of all nations. (Matt.28:18-20). God wants to reach every person in the world and he has chosen his followers, you and me, for this task. We are God’s missionaries in this world. We are on missions for Jesus. What does it mean? Luke tells us the story of an encounter Jesus had with a man named Zacchaeus. Zacchaeus had heard about Jesus and he wanted to meet him, but he had a disadvantage in the middle of large crowds. He was short. – He was a chief tax collector and very wealthy. – Wanted to see who Jesus was, but there were many people around Jesus and he was a short man. – He climbed a sycamore tree to see Jesus when he passed by. All that Zacchaeus wanted was just to see Jesus; however, he got more than he bargained for. Zacchaeus came down immediately and welcomed Jesus gladly in his home. He saw Jesus, but he got more than that; he got to spend time with him. This was very disturbing in that society since you would eat only with those who were like you. Usually tax collectors would eat with tax collectors; Jews would eat with Jews. Jesus tells us why the change in Zacchaeus. He found salvation. Only Jesus can transform a person like Zacchaeus. He too is a son of Abraham. All those who believe in Jesus are known as descendants of Abraham by faith. (v.10) For the Son of Man came to seek and save what was lost. This was the mission of Jesus, he came to seek and save what was lost. Zacchaeus was lost and he didn’t know it. He was rich, but lost. He needed more than just seeing Jesus, he needed to experience Jesus. Once he did that, his life was never the same. Jesus came to seek and save the lost; people without God in their lives are lost. There are lost people all around us. They are lost because they haven’t found salvation in Jesus yet. When Zacchaeus found salvation, he was no longer lost, but found. Anyone who haven’t believed in Jesus as Lord is lost and in need of his grace. Every race has lost people. Every institution, community, etc. Jesus came for them. Jesus’ mission is our mission. We are to seek and bring salvation to those who are far from God. How did Jesus seek the lost? He went to them; he hanged out with them, associated with them. HE was intentional about it. How are you to reach the lost today? You have to be intentional in your approach. You have to make the decision to go where they are. You must associate with them, hang out with them, be a friend to them. Jesus is sending you to them. You have to be intentional at work, at school, where you shop at, where you go or travel. When Jesus was criticized as to why he chose to hang out with sinful people. He said the healthy don’t need a doctor, but the sick do. He came for the spiritually sick, those who are lost and in need of his saving grace. Our job is to seek, search for the lost so they can be found. It starts by being willing to hang out with them. Have lunch with them, have coffee with them. Zacchaeus’ life change dramatically during meal with Jesus. You could create a huge impact in someone’s life just because you chose to befriend them. Our mission is the same as it was for Jesus; we are to search for the lost. You will never reach lost people hanging out only with Christians. Our mission is accomplished when each of us decide to be intentional about talking, spending time with non-believers. It won’t be accomplished if we don’t go where they are. 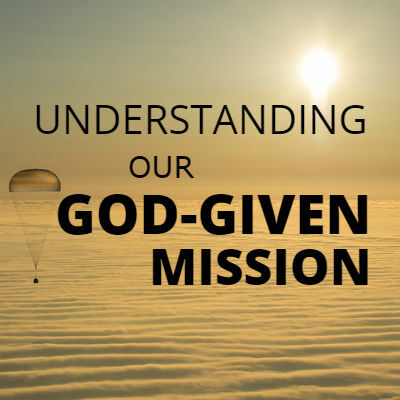 Jesus gave us a mission, but he also showed us how to accomplish it. Now it’s up to you to do it.